Summary: In the grand tradition of Anne of Green Gables, Bridget Jones’s Diary, and The Three Weissmanns of Westport, Andi Teran’s captivating debut novel offers a contemporary twist on a beloved classic. Fifteen-year-old orphan Ana Cortez has just blown her last chance with a foster family. It’s a group home next—unless she agrees to leave East Los Angeles for a farm trainee program in Northern California. 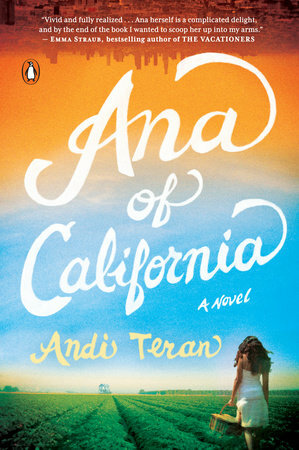 One book that I'm really excited to read is ANA OF CALIFORNIA by Andi Teran. This novel is a retelling of ANNE OF GREEN GABLES with a modern and diverse cast of characters! Ana is a fifteen year old orphan who lives in East L.A. She's just used up her last chance with a foster family and she will either be sent to a group home or a farm trainee program in Northern California. Ana doesn't seem like she will fit in on the farm; however, maybe Garber Farm is exactly what Ana needs! ANA OF CALIFORNIA sounds fantastic and I can't wait to read it. I'm embarrassed to say that I've haven't ever read ANNE OF GREEN GABLES though, so my goal is to read both books this summer! In fact, I think book clubs should consider reading both ANA and ANNE and discussing. The publisher has put together a wonderful book club kit which would help make your meeting fun. There is a link to some discussion questions, along with an author interview, a map, a playlist, further reading suggestions, and even some recipes! Thanks to the fine folks at Penguin, I have a copy of ANA OF CALIFORNIA along with a gorgeous copy of ANNA OF GREEN GABLES to share with one lucky reader. To enter, just fill out the form below before July 16th at 11:59 p.m. EST. I will randomly select and notify the winner the following day. This contest is open to those of you with U.S. addresses only. Good luck! You'll think I'm some sort of Philistine, but I've never read Anne of Green Gables! I'd love to have this set. Thanks for the great reviews & giveaways! I've also never read Anne of Green Gables. I reviewed Ana of California on my blog today. I'll be interested to see what you think once you've finished the book. I'm wondering if having read Anne of Green Gables makes a difference in how much the reader will enjoy this one.